Using an unexploded 16 inch (406 millimeter) HC Mark 13 1,900 pound (862 kg) battleship naval shell for a resting place, Private First Class Raymond L. Hubert (October 17, 1924 - May 17, 1988) of Detroit, Michigan, attached to the 2nd Marine Division, 8th Marine Regiment, shakes sand from his boondockers. 8th Marines succeeded in reaching the sea in the vicinity of Tanapag Harbor at 1300 Hours on July 4. The regiment went into reserve the next day. A Browning Automatic Rifleman ("BAR Man"), Hubert was washing his feet in the surf when Staff Sergeant Andrew B. Knight (November 8, 1916 - March 25, 1959) of Washington, District of Columbia, asked Marines to pose for photos. Knight was a former Washington Post photographer. Hubert was putting his shoes on when the photo was taken; Knight asked him to "do something" so he sat on the dud shell. 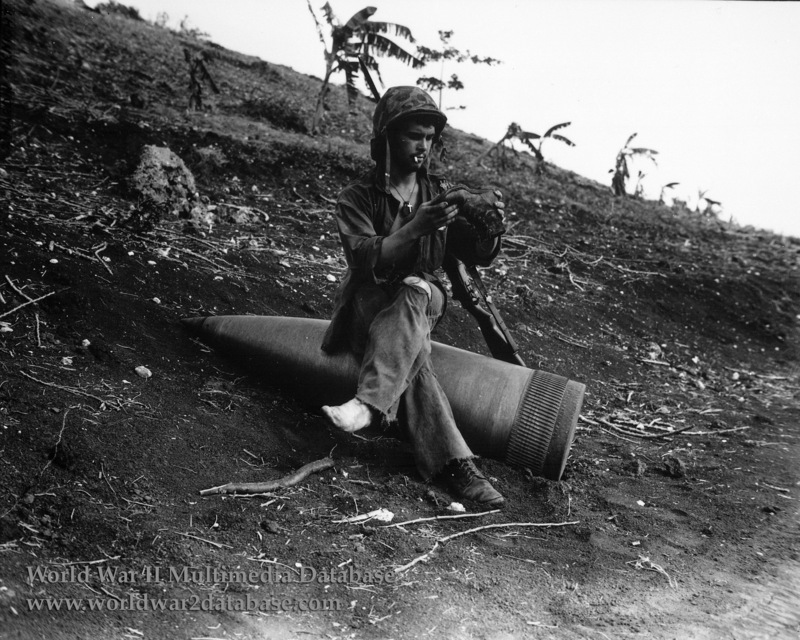 Hubert sat on the shell knowing full well it was armed and could explode any time. A buddy handed Hubert his M1 Garand rifle for the photo. This photo was circulated nationally during late July - early August 1944, appearing in the Washington Post, Bakersfield Californian and other newspapers. Hubert was a tool and die maker for the auto industry after the war. Knight, whose first wife was popular Big Band singer Evelyn Knight, returned to photography at the Washington Post and died of an esophageal hemorrhage at age 42 and is buried in Arlington National Cemetery. This photo later was the basis for a mural at Camp Pendleton.